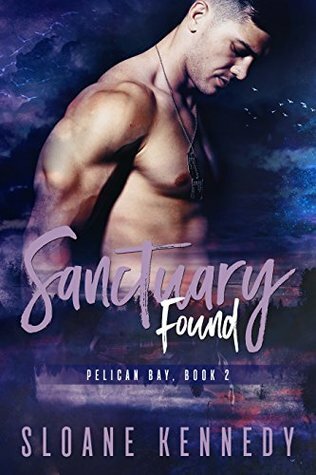 Sanctuary Found Review ~ Emotional read … 10 out of 10! Cover Art: A shirtless man with dog tags stands silhouetted against a night sky. A perfect representation of Maddox, one of the main characters. Lettering is in lavender and white, all clearly readable. Clearly States it is book 2 of a series but it can be read as a standalone. Synopsis: Excellent intro to characters and plot without giving away the surprises in the story. Plot: Maddox Kent returns to his hometown after the end of his military career to mend the rift with his brother Dallas. As he’s working to make amends by helping at his brother’s wildlife sanctuary we meet Isaac who is also trying to make amends with Nolan and their paths cross. Isaac’s quick stop turns into a longer one thanks to car trouble which strand him and Newt at the sanctuary. A very well-conceived and written plot. Main Characters: Maddox,a 32 yr old ex-military who suffers from PTSD and is trying to make amends with his younger brother. Isaac who is 21 and running from something with his 4 yr old brother in tow, who is trying to mend past wrongs to Nolan. Both are likeable and relatable, and Isaac turns out to be quite a complex character. Secondary Characters: Dallas and Nolan make a return appearance. They are from book one. Newt really stands out, he is Isaac’s 4 year old brother and is a sweetheart. Gary is the bad guy here, the type with no redeeming qualities that you love to hate. He’s the reason for mentions of child abuse so if that’s a trigger read with caution. Flow/Continuity: Story flowed well with no breaks or continuity problems to interrupt reading. Conflict and Climax: Only conflicts was one the characters had with themselves. They were both fighting internal battles. Isaac’s was what he was running from and what he would do to keep Newt safe and Maddox was fighting the battle of what he had seen and done and how to correct wrongs toward his brother in the past. The climax came when they opened up enough to be able to help one another and the healing for both began. Editing/Formatting: There were no errors that take the reader out of the story. Conclusion: This was an emotional read, but well worth it. It has a character driven story arc. Isaac is the heart of the story. His struggles and secrets go well beyond his years. Maddox has his problems, but overcomes them by helping others. There is a hea but the characters fight through each other’s and their own problems to get there and that makes it more satisfying. Previous Kick Off Review ~ A university story … 8 out of 10! Next Dead Silent Review ~ Entrancing read … 9 out of 10!